This is the first true gourmet instant coffee we have tasted. We have compared it to over 30 other popular Asian and USA brands such as Vinacafe, Coffee King, Nescafe, etc., and the G7 is far richer and has the full-bodied flavor that is absent from most instant coffee. Trung Nguyen commissioned a state-of-the-art Italian-built facility in Buon Me Thuot to process G7 3-in-1 in 2002 and it has been the top Asian "white coffee" since. The reason is simple; it is the only instant coffee in the world that is processed from green, unroasted beans, and is powdered and roasted in the same operation. This process preserves more flavor and results in a smooth and non-bitter coffee. All other manufacturers use brewed coffee that is then freeze-dried in one fashion or another, which creates bitterness. 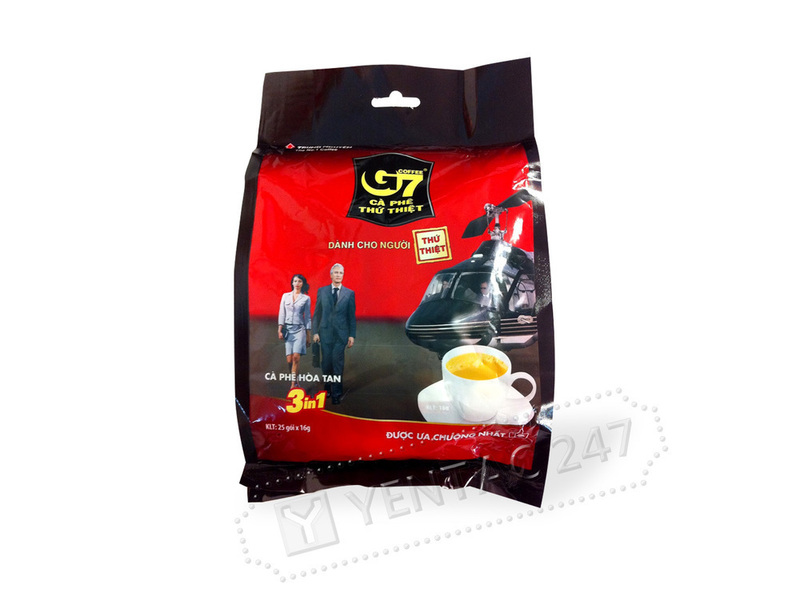 The G7 has its own unique taste, different from the Trung Nguyen brewed coffees, and fans of G7 will accept no substitute! Starbucks has recently introduced Via, an attempt to duplicate the dry roasted process of G7, but our public taste tests between these two products favor G7 over Via approximately 2 to 1 in favor of the rich, "unburnt" flavor of G7. This is a great cup of coffee to bring with you when traveling or when you don't want to brew. All you need is hot water and you can have gourmet coffee anywhere... in your hotel, at breakfast, when camping or on the road traveling, etc. Many offices and shops offer this coffee as a perk to employees, especially if they don't want to maintain a brewing station. It's the ultimate in convenience. G7 is also available in Black Unsweetened and Cappuccino flavors. Please note: Our non-dairy creamer ingredients are considered milk-free by the FDA, but still do contain a small amount of caseinate, a milk protein commonly used in coffee creamer. Lactose intolerant individuals should have no problem, but vegans or individuals with severe milk allergies should try the delicious G7 Pure Black instant coffee. All G7 products are independently tested for safety and purity by third-party labs in Germany and Malaysia, and its ingredients NEVER come from China. One sachet makes a standard 6 ounce cup; use 2 sachets for mug strength.